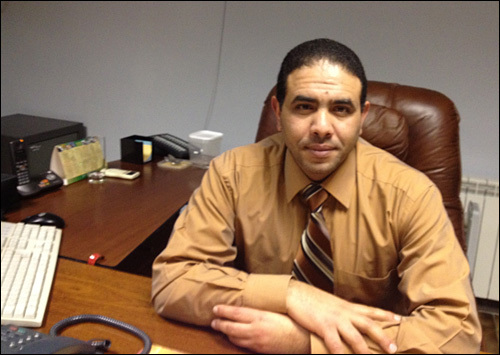 Jamal Abedal-Karim Abu Nemer M.D., Ph.D.
1998-2001 - Government Emergency Hospital. Simferopol, Ukraine Dr. Orthopedist-traumatologist. 2001-2003 - Academy of after university education, Kyiv, Ukraine. 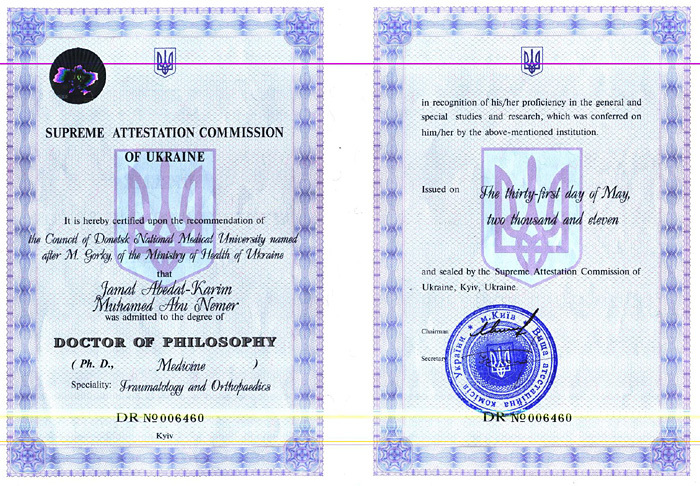 Diploma "Master of traumatology"
2011 - was admitted to the degree of Doctor of philosophy. The dissertation "Optimization of the level and type of osteotomy in case of endosseous distraction osteosynthesis of the shin-bone with drive devices". Tendon (one, two and more). Plasty of coracoclavicular acromial ligament. Two and more bones (pins, plates). Radial bone (distal part, pins, plates). Ulnar and radial shaft (plates). Olecranon (pins plus figure-of-eight cerclage). Fracture of radial bone capitulum (plates). Humeral shaft (comminuted and non-comminuted fracture). Plates, intraosteal fixator. Fracture (comminuted and non-comminuted). Plates, two pins plus figure-of-eight cerclage. Femoral neck (three screws, Hamm’s intraosseous fixator). Transtrochantic or transtrochantic comminuted and non-comminuted fracture (Hamm’s intraosseous fixator). Femoral shaft (comminuted and non-comminuted fracture) using intraosseous fixator, plates. Shinbone (comminuted and non-comminuted fracture) plates, intraosteal fixator. Distal metaepiphysis of one or two ankles (plates, screws). Fracture of both ankles plus posterior edge of shinbone (plates, screws, pins). Hip bone injury. Osteosynthesis of symphysis (plate). Open injuries of bones and joints with soft tissue defects. Forearm (ulnar and radial bone). Bone graft drawing from ilium wing. Long tubular bones (plates, intraosseous fixator). I noticed Dr. Jamal Abu Nemer back in 90-s, when I was teaching the Traumatology and Orthopedics Course in the Crimea Medical University. Jamal Abu Nemer was inquisitive and a can-do person that attracted attention to him at once. During his work at the Traumatology and Orthopedics Specialized Department he acquired technics of various surgical interventions, which he now performs by himself on a high professional level. I would like to mention his achievements as a doctor in practice and as a scientific researcher in development of the method of intraosseous distractional ostheosynthesis. It has been over 10 years that I see him thoroughly preparing for every surgery, chooses optimum soft method for each patient. Doctor Jamal Abu Nemer is coauthor of many technical decisions being base of the method that is reflected in many joint patents and scientific articles. He performed independant surgeries by the Bliskunov’s method. The doctor pays much of his attention not to the surgeries only (implanting the devices), but also to such important periods of the lengthening program as distraction and rehabilitation. That allows to obtain fine clinical results. The doctor doesn’t stop on the already well approbated methods such as limb lengthening methods. He is actively participating in development of the intraosseous distraction method for complicated cases in patients with significant defects of their long bones and cases with trauma of vertebrae. This man is known as goal-oriented and responsible, he completes his tasks perfectly. It is important for every doctor to be hardworking and compassionate. This is what he is too. It imposes upon me that our respondent always tries to complete all issues to avoid any doubts. Though he doesn’t hesitate to say his opinion that is eventually helpful for the project.